I'm so sad to note the passage of Stan Lee, co-creator of the Marvel Comics Universe, who died at age 95 today. This is a day we all suspected was coming soon, but one that hits hard, nevertheless. For those of us who grew up reading his comic book scripts and Stan's Soapbox columns, and, I suspect, for those who've grown up seeing his many cameos in Marvel's movies, it's difficult to contemplate living in a world with no Stan Lee. I know it's going to take me a long time to get used to it. Without a doubt, I'll be paying tribute to Stan and his fellow Marvel creators for a long time to come here at Pop Culture Safari. But, today, I'm thinking about the one brief moment I got to spend in the presence of the Man. I grew up in a state that doesn't have much in the way of comic book conventions, so my direct contact with the comics creators I admired as a kid has always been pretty much limited to the actual pages of comic books themselves. 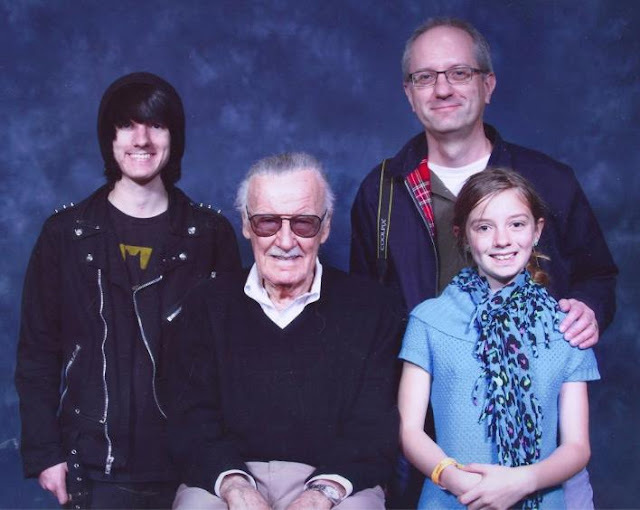 Several years back, though, I did manage to make it to a con at which Stan was a featured guest. In fact, Stan's presence was pretty much the only reason I made the trip. Sadly, Stan didn't present a lecture or participate in a Q&A at the event. But he did, for a considerable sum, pose for pictures with fans. I think such photos are a weird phenomena. They seem so strangely transactional and raise all sorts of questions about fame and how bizarre it is. Are fellow humans really that much more important than the rest of us that we should pay to be in the same picture frame as them? I mean, Stan was just a guy, right? But I paid and it was worth it, not just for the pic below of me, my kids, and Stan, but also for the chance to say, literally, "thank you," which I did right after the shutter clicked. Stan at that moment was functioning, basically, as a human prop. In fact, that's what he looks like in the picture. He didn't have much time to move, let alone speak, before the next set of fans sidled up next to him. But he did give a smile and a slight nod of acknowledgement at my comment. And my inner fanboy smiled, too. I'm glad I had the chance, in person, to say thanks to one of the people who helped make my childhood a little more magical. Thank you, once again, Stan, for all those Marvelous memories. And, to all my fellow fans out there, I'm thinking of you. Be well. This is a tough one, but we'll make it through if we all hang together.